The Cook Road Bridge over the North Fork of Dry Creek is near the western border of Amador County and it's just east of where several tributaries come together and flow into Sacramento County, eventually joining the Mokelumne River. The bridge is a two span (160 ft long) continuous prestressed box girder bridge on a single column bent that was built in 1998. It replaced a Pratt truss bridge that stood at this site for over 100 years (since 1895). 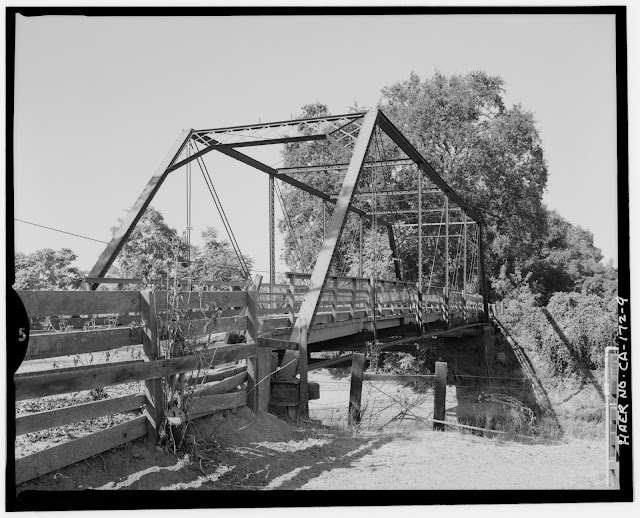 Many photos of the original truss bridge are available at the Library of Congress Website. The original bridge was considered of historic importance as the oldest metal truss bridge in California that was built by the San Francisco Bridge Company. Because it is eligible for inclusion in the National Register of Historic Places the county didn't just sell the original bridge for scrap metal. I found it sitting a couple of miles away on the edge of a golf course (38.35466°, -120.95880°). Perhaps they are hoping eventually to use it to carry golf carts over a water hazard. Amador County, California Bridges: Cook Road Bridge (26C0048) across Dry Creek (1) by Mark Yashinsky is licensed under a Creative Commons Attribution-NonCommercial-ShareAlike 3.0 United States License.